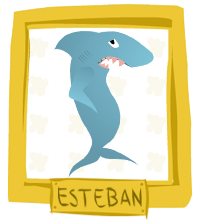 By day, Esteban the shark is a ruthless killing machine, by night he is a gentle lover of spoken-word poetry. When he is not brutally ripping apart surfboards and confused starfish, he is performing at open-mic nights hoping to make it big in the high-paying field of shark poetry. Esteban learned his love for poetry from his mentor, a Japanese Jelly Fish named Sensei Stevens. When Sensei Stevens tragically washed up on the shore of an Australian beach, Esteban needed to find a way to express his grief. At first Esteban ate passing cruise ships, however he needed a better way to express his grief, and so he turned to poetry. Esteban’s poems were so touching that he soon earned an invite to the Rich Morning Show to perform his classic Poem ‘The Four Seasons’. He can be found looking for inspiration and hope in the Pacific Ocean, often wearing a beret and fake beard.